Recent protests, both by white nationalists upset at attempts to erase the Confederacy from America’s collective memory and their far-left counterparts objecting to First Amendment protections for racists, are generating heaps of commentary and analysis. As well they should. America has made great progress in bridging the racial divide, and the resurgence of race-based violence is an unsettling development worthy of introspection. To be effective, however, such analyses must present relevant facts fairly and correctly. Framing events such as the tragedy in Charlottesville within the proper context can be a powerful force for unity. Failing to do so, however, can be an equally powerful force for division, an outcome on full display Sunday in Berkeley, California as the alt-left group known as Antifa once again resorted to its trademark violence. 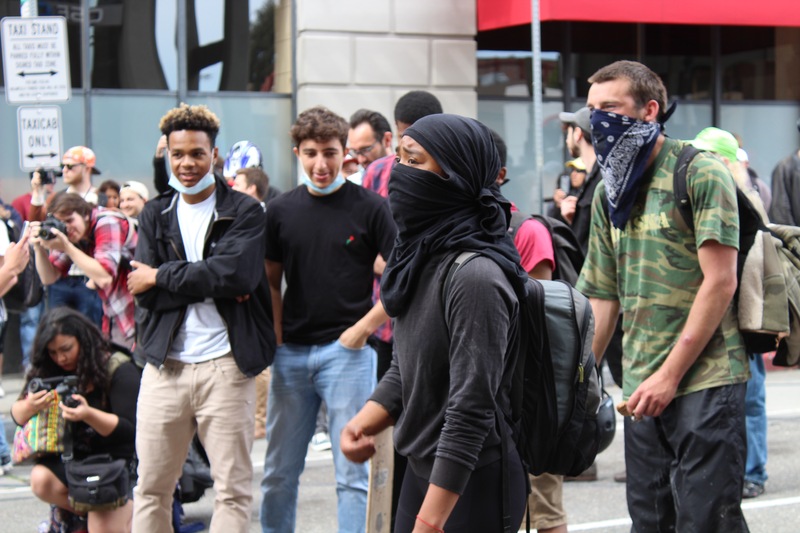 While radical leftist organizations such as Antifa and Black Lives Matter have been wreaking havoc for years, the media’s Nazi delusions in the wake of Trump’s election and Charlottesville have only emboldened the far left and paved the way for violence in the name of opposition to an ideology that in reality hardly even exists. The delusions are many, but the most common make two general misassumptions: that white supremacy is a uniquely American problem, and that its numbers are sufficient to threaten the (relative) political peace. For starters, fringe groups such as white nationalists, and their Antifa counterparts, are inevitable in a free society. Cultures that permit a “marketplace of ideas” will almost certainly produce some pretty bad ones, and in an age in which the Internet enables a free flow of information from every ideological angle, these bad ideas will inevitably find some takers. Misguided young men seeking scapegoats for their own shortcomings are not a new phenomenon. Just ask Europe. Despite the continent’s dark history with race, hate groups are equally, if not more, vocal across the pond. And this despite the fact that many European countries have “hate speech” laws designed to silence unsavory opinions. Protection of even vile speech is a uniquely American ideal, and it may well be the only reason that extremist groups have remained on the fringes for so long. Our marketplace of ideas may permit the sell of distasteful merchandise, but it also exposes it for the junk it is. And Americans, on the whole, prefer quality. In fact, the size, or lack thereof, of the mobs stirring up our cities tells us plenty about general American attitudes toward them. Think about it: almost without exception these rallies are comically small, and Charlottesville was no exception. It is difficult to say for sure just how many white supremacists descended on the idyllic Virginia town that day, but numerous groups were represented and the crowds in the circulated videos and images resembled a poorly attended high school football game, at best. While it is indeed unsettling that these groups still exists, it’s nothing short of remarkable that their members number so few in a country of more than 300 million. In fact, it should be considered a point of national pride. Sadly today’s headlines announcing an imminent takeover by Nazis and various other white supremacists are having a similar effect. Besides revealing the innate biases of reporters and the overall dismal state of the modern press, they are also mobilizing and legitimizing violence by impressionable far-left mobs. After all, who can blame Antifa for meeting this fictional scourge fist-to-fist? To be clear, I can’t tell you precisely how many Nazis and white supremacists there are in the country. It’s an impossible task for numerous and obvious reasons, but it’s likely closer to 10,000 than 100,000. There are plenty of other data, however, that clearly point to a stark decline in extreme views on race among Americans over the last few decades. Consider research in 2013 that found America to be one of the world’s “most tolerant” countries, a metric supported by the near-universal outrage following the events in Charlottesville. Add to that the fact that the Ku Klux Klan, the country’s largest white supremacist group, has seen its membership dwindle from millions roughly a century ago to a few thousand five years ago; acceptance of interracial marriage has soared from 4 percent in 1958 to 87 percent in 2013; and from 1972 to 2010 the number of white Southerners who said they wouldn’t vote for a black President shrank from 48 percent to six percent, and it becomes obvious that the threat posed by white hate groups is essentially nil. Obviously these numbers don’t tell the whole story, but the story they tell is a powerful one, and one that should put the pitiful Nazi plague in its proper context. But to read or watch the news is to be convinced that Nazis and white supremacists exercise a disproportionate influence on the political and cultural trajectories of this country, when in reality it is an ideology on the verge of extinction. By inflating their influence the media are giving these hate groups new life and enabling further violence by left-wing mobs intent on destroying a boogeyman that hardly even exists.